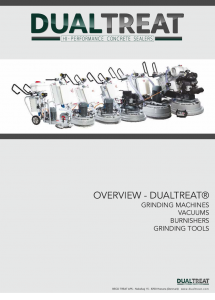 Grinding machines and edgers from DUALTREAT® have been developed to increase efficiency and productivity. 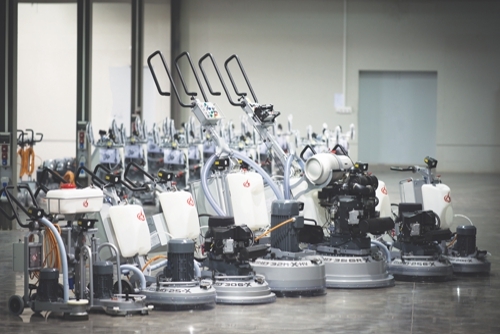 The low machine maintenance down time allows long operating times with little interruptions. The great demand has caused us to offer the first line of high speed burnisher. Our wide range of grinding machines and burnisher is known for its long service life. They are extremely easy to use, versatile and extremely efficient. The new X-Series have been designed in order to meet the most demanding requirements with a very low machine maintenance. Basically, the different models differ in size based on the surface to be processed. Catalogue Grinding Machines for our partners. 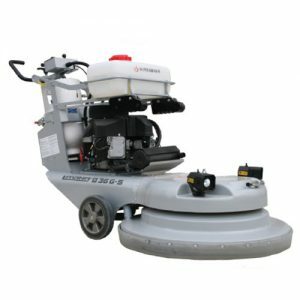 L20N-X (510 mm working width) is the perfect beginner model for all kinds of grinding and polishing works and surface preparation. The machine is detachable into two parts without any effort, being easy to transport by stairs. This machine is also available with power current (3x400 V, 5.5 kW). Machine weight: 172kg. Grinding pressure: 91kg. 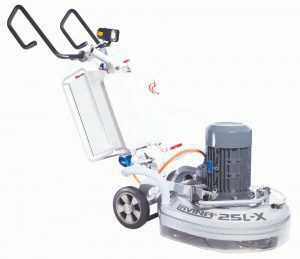 L25-X (655 mm working width) is a reliable and powerful machine for the daily use. Through its compactness and ergonomics it is excellent for use in all area s. The machine is detachable into two parts without any effort, being easy to transport by stairs. The same model is also available with a powerful 11kW engine. Machine weight: 252kg. Grinding pressure: 141kg. L 30G-X is an advanced version of the L25-X (655 mm working width). Due to the larger grinding heads and the existing dust cap, a working width of 765mm is achieved. Optimal handling when used on large surfaces. Machine weight: 375kg. Grinding pressure: 170kg. 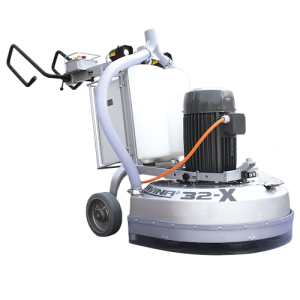 L32-X (810 mm working width) is the ideal solution for large areas. Due to its powerful engine and high grinding performance, the machine can also be used under the most difficult conditions. The same model is also available with radio control, which considerably facilitates work. Machine weight: 437kg. Grinding pressure: 314kg. 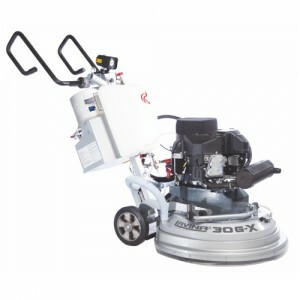 The 13-X Edger is very efficient to process edges and corners. 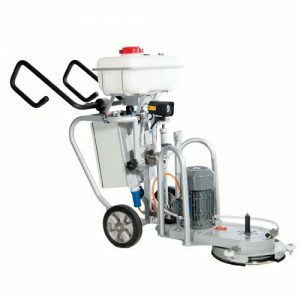 On inaccessible areas for grinding machines the powerful edger gives to the floor a fantastic finishing and refines the overall image of the treated surface. Machine weight: 107kg. Grinding pressure: 26kg. 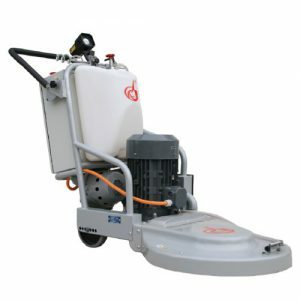 The 10PS-strong B21 Burnisher (533mm working width) is particularly recommended for concrete floors with high gloss finishing. 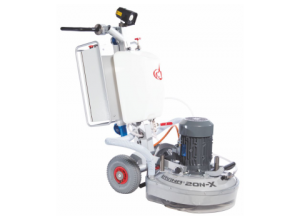 With a weightWeighing 146 kg, the machine carries out the recommended pressure on the ground and gives your concrete floor with 1500-2000 rpm an extreme shine within a short time. The large 20-liter water tank allows working processes with very few interruptions. Machine weight: 146kg. The B36G-S Burnisher has a working width of 914 mm. The machine is powered by a 18hp-strong Kawasaki propane engine and reaches up to 3000 rpm. Large areas are transformed within a very short time in high-gloss surfaces. With its 3 polishing heads this machine is highly recommended for a DUALTREAT® treatment. The large dust container allows long and wireless operating times. Machine weight: 280kg.